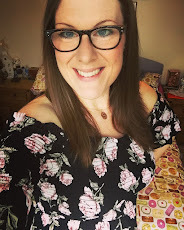 This months challenge wasn't so much of a 'bake' but a 'make' - and one, like everything else on my list, that I'd never gotten round to making before. I really wanted to give them my best shot, and I was pleasantly surprised with the outcome. Although they didn't beat the 'secret' recipe of the Jolly Farmers rings, they definitely gave them a run for their money - and I always get a huge buzz from creating something I've never made before and it working out well. I found this recipe worked really well (it is a combination of about 4 different recipes I've read) and it made a hugely generous portion for two people. 1. 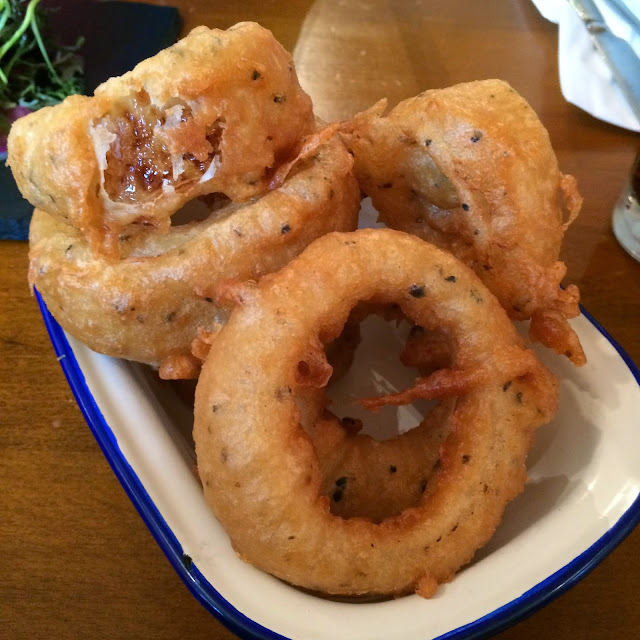 Sprinkle the onion rings with a little of the plain flour so each ring is lightly coated in flour. Set aside, and make your batter. 2. Pour the rest of the flour, all of the spices and seasonings in a bowl and whisk with the beer to form a smooth batter. Set aside for 10 minutes to rest. 3. 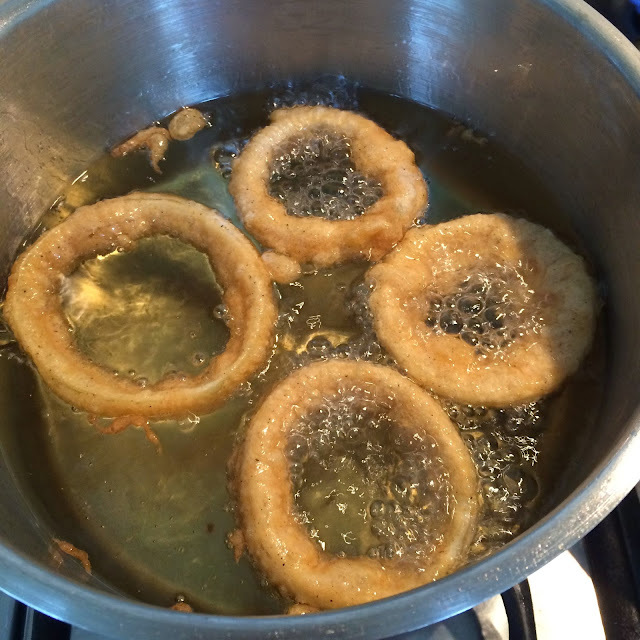 Pour the oil into a large saucepan and heat up - when the oil reaches the right temperature for frying the onion rings a small piece of bread should brown when dropped into the oil. 4. 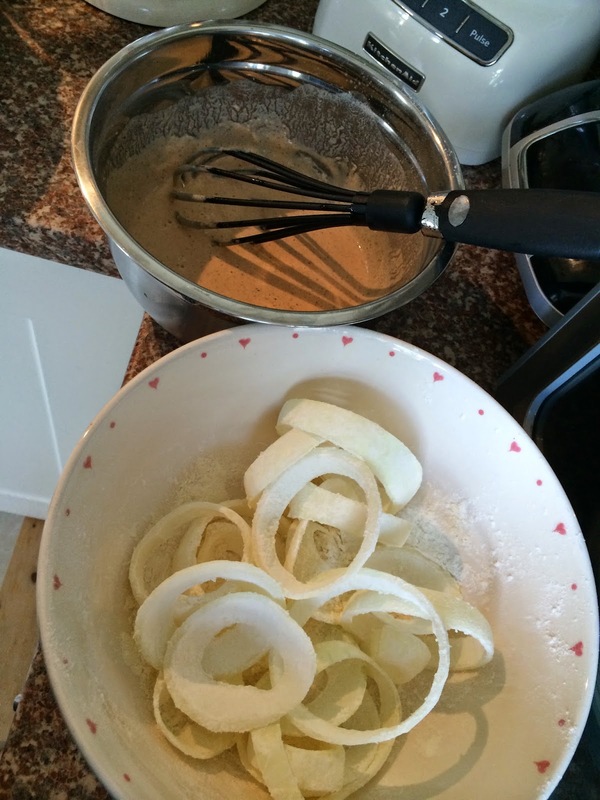 Dip the floured onion rings into the batter, and then drop carefully in the oil. Fry for 3 minutes in total, turning halfway through frying to ensure an even colour. Use a slotted spoon to remove from the oil, and place on a plate lined with kitchen towel to blot the excess oil. 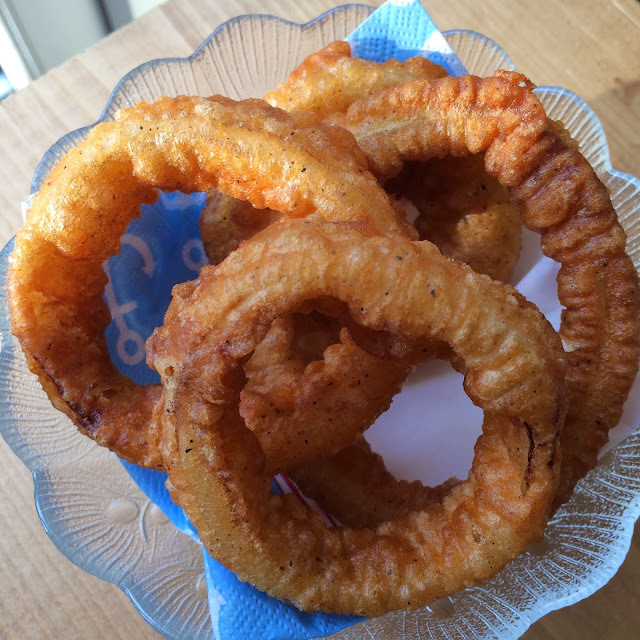 I cooked the onion rings in batches of 4, they cooked really evenly and smelt incredible as they cooked - it was so hard not to munch on one as soon as they'd cooked. Hubby got to work on the BBQ and put together a delicious beef burger in a brioche bun with cheese, bacon, gherkins and sauce to go with my onion rings- and together we had a treat meal made in heaven! I made a yummy lemon and pepper mayonnaise which was the absolutely perfect accompaniment to this dish - the lemon in the mayo really cuts through the oil from frying them, and the pepper is the perfect seasoning with a creamy lemon flavour, I think. Oooh I'm sad that I've finished them. My homemade beer battered onion rings, you have to try these - they are divine! Treat meal made in heaven! 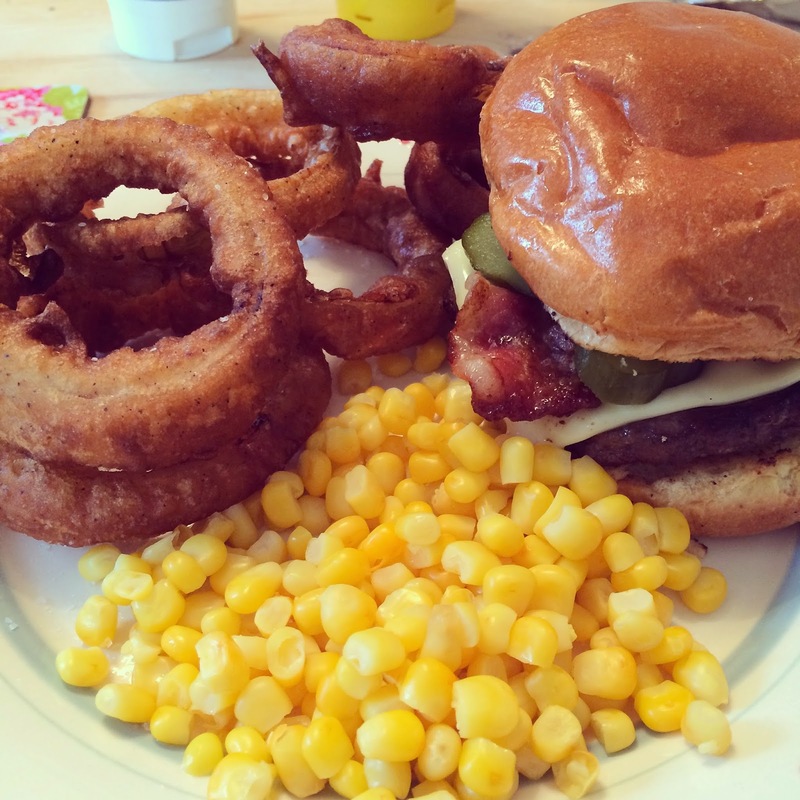 Cheese/Bacon burger, onion rings and sweetcorn. 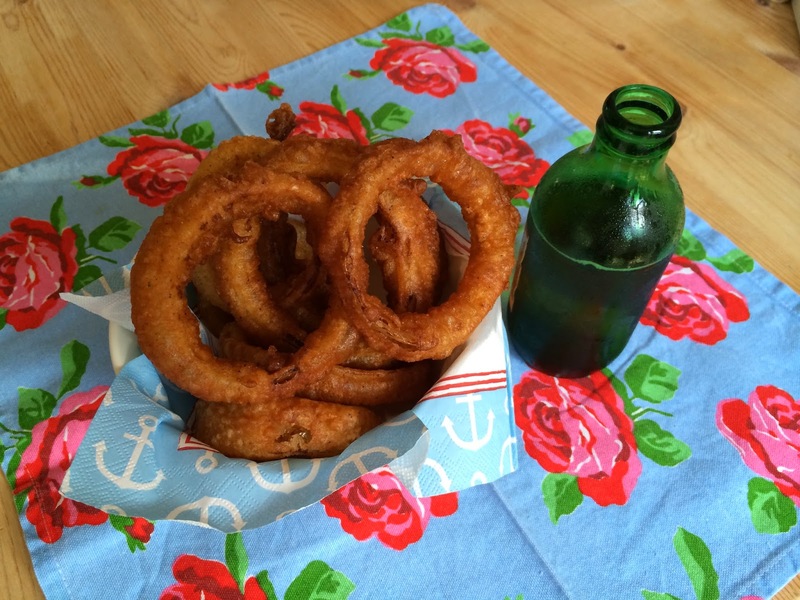 The perfect football-watching treat (if you can still bare to watch the World Cup) - onion rings and beer - a match made in heaven. Have you baked anything new this month? They look delicious. 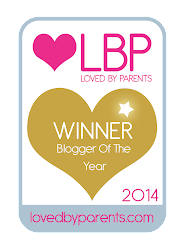 Thanks for linking up, not sure if you have my badge somewhere else but if not, please add and/or link back on posts you've linked up to if you can, thanks!